The Town of Sandwich has so much to offer, from Heritage Museums and Gardens in Sandwich to the historical district, and much more. Another great reason to visit Sandwich is its many beaches. Town Neck Beach, Sandwich. This beach is lovely, but it may be best known for the iconic Sandwich Boardwalk which is covered in dedications from the people who donated the money for the planks. There is a spot that people enjoy jumping off of (at high tide), and once you finish meandering the boardwalk, you reach the beach, which has several stone jetties off of the relatively pebbly beach. From the beach, you can watch boats passing through the Cape Cod Canal. The water is usually pretty calm, and this can be a great place to bring the kids and spend the day. There are restrooms and lifeguards on duty during the season. To park, you need a sticker. The beach is located off Town Neck Road in Sandwich. East Sandwich Beach, Sandwich. This beach is very scenic and relatively calm, and there is plenty of room on the beach. The sand on the beach is nice and soft, so it is a good spot to dig your toes in! There are rock jetties off the beach. There are restrooms and you need a sticker to park here. Lifeguards are on duty during the summer season. The beach is off of North Shore Boulevard in Sandwich. Sandy Neck Beach, Barnstable. This beach is technically in Barnstable, but the road to reach it is in Sandwich and the beach is popular with people in both towns. Sandy Neck has a very large beach with soft sand interspersed with pebbles. There are stairs down to the beach. Residents of Barnstable and Sandwich can use their stickers to park, but there are day passes available at the gatehouse for $15/weekdays and $20 for weekends and holidays. Parking is free after 3:30pm. The beach and conservation area can be found at 425 Sandy Neck Road in West Barnstable. Scusset Beach, Sandwich. This beautiful beach has soft, enjoyable sand and a rock jetty, as well as a boardwalk. Lifeguards are on duty during the season and there are many amenities here, from restrooms and showers to a picnic area. This is technically a State Beach, so to park, you can pay the daily fee of $14 for Massachusetts residents and $16 for out of state residents. There are season passes available as well. The cost is $60 for Massachusetts residents and $85 out of state residents and the passes can be purchased at the office at 20 Scusset Beach Road where the beach is located. 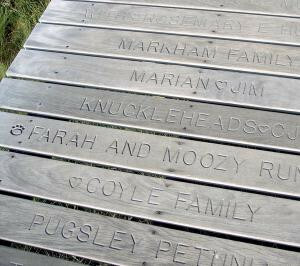 You'll chuckle reading the personalized planks along the Sandwich Boardwalk. Photo by Jane Booth.